Metal Fans who are in Fredericton or have ways of getting there will not be left wanting more after this year’s first ever East Coast Awakening. On July 29th over 70 bands will converge just outside of Fredericton at Wark’s Point Wilderness Getaway in Keswick, NB. A venue which is commonly known for the annual electronic gatherings of Future Forest will have to clear the way for an army of metal heads eager to crank the volume on a brand new festival. East Coast Awakening is a promoter of local shows year round in the Fredericton area. In just under a calendar year, founder Dave Manning has created a steady flow of local shows which have provided local bands with the opportunity to play regular shows and share the stage with some highly touted names inside and outside the Canadian music scene. Some notable names being Insurrection, Bookakee, Gorod, I Set My Friends on Fire and Canadian metal icons Beyond Creation, who are already slated for a second show under East Coast Awakening this October. 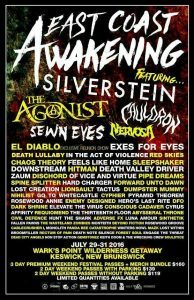 Being added to that list of notable names this weekend are festival headliners Silverstein, The Agonist, Cauldron, A Sight For Sewn Eyes and Nervosa. All of which should draw a significant crowd. However, if you’re wondering where to go and who to watch before the main event, here are some other names you should get familiar with if you have not already. One of the youngest bands in the Fredericton area, Cable Crusher has been all over the Fredericton scene this year. Whether you are into them because of the pants they wear, their allegiance to Rob Ford or their successful strides at pumping some youth into the Fredericton punk rock scene, these kids are doing just fine! Definitely a must-see if you come to town! Plus,they have a Yeti, how badass is that? These long time veterans of the Halifax scene bring a mixture of everything we’ve come to love about modern metal. Drawing from the influences of Periphery, Meshuggah and The Dillinger Escape Plan, Forward Unto Dawn brings an intoxicating mixture of chaotic riffs, constantly changing time signatures and clear concepts through their cohesive lyrics. This was evident in their 2014 release Alpha, where the band flawlessly managed to create a dialogue between three characters (The Creator, The Resistor and The Destroyer) while still maintaining a solid structure within each song and pairing each one with their own set of mind bending riffs. More recently, the band has released multiple videos through their social media accounts of them working on new material, frequently mentioning the name “Xi” in the captions. Is this the name of a song?, album?, or both? Maybe we’ll find out this weekend at ECA. Another band with the theme of “Youth Movement” is Elevate The Virus. Hailing from St. John, New Brunswick, they are the east coast’s spawn of Lamb of God. Their debut release “Epidemic” caught the attention of many in 2015 with its tasteful groove and hard-hitting sound that is mature beyond the bands years. They also made major waves that year with their impressive performance at the Maritime Metal and Hard Rock Festival 3, a spot they earned by winning the battle of the bands at the festival the previous year. Their high energy and lively stage shows will make them a fun band to follow in the years to come, and although things have been quiet on their end in terms of new material lately, you never know what these guys will have up their sleeve for a big stage like this one! Quite possibly the busiest of the bands on this list this year, Lionsault has been on a tear through Eastern and Central Canada since the release of their debut album back in September. Titled “Are you feeling lucky?” this pulse-pounding rock record was at the head of the pack of great releases from the St. John area this year. The album received significant airplay and carried the band into their “Sick As It Gets Summer Tour” which recently wrapped up on July 8th. So expect their stage legs to be in mid-season form when they hit up ECA. Fronted by former Anesthesia vocalist Tyson Davidson, I, Monolith is one of Fredericton’s newest bands having played only two shows to date, with their next being ECA. They bring a slew of old school thrash with an uplifting bounce that will definitely have the crowd moving from beginning to end. It’ll be intriguing to see what kind of presence they will bring to their first festival performance. After reuniting for the first time in 20 years back in the fall of 2014, the Wasteland Zombies have proven that despite their age they still know how to bring the same energy to their shows as they did back in 1994. Since they’ve risen from the dead, these ageless rockers have been playing with bands young and old across the east coast, including a supporting spot on a few dates of the Neighborhood Watch reunion tour back in October. Fronted by Chris Waddell, a veteran of the music scene, and rejuvenated by the younger talent of new bassist Jake Taylor and new guitarist Jamie Norrad, the Wasteland Zombies have certainly made a successful comeback. ECA has the potential to be a highlight for the band as they play one of the biggest stages their scene has seen since they first formed back in 1993. A collective of members from four different Halifax bands, Chamber is most likely the band you are least familiar with. Having only played a pair of shows to date, Chamber has just recently began to rumble beneath the surface of the Halifax metal scene with their release of “Agony. Always.” a two track sampling of the band that clocks in at just under three minutes. However, despite having a finite amount of material released, you learn a lot about this band in a short amount of time. Both songs are captivating as the band captures their abrasive sound into a crystal clear recording. Their quality definitely making up for their lack of quantity at this time. This band will definitely become a tease to anyone who listens to what they have so far. Considering their last minute addition to the festival, this puts them into the category of dark horse and a band you certainly should not sleep on. Fallen Pawns have been quite dormant for the last little while, however, they will still be an intriguing band to watch for anyone who is aware of what they are capable of when they play live. Lead by another impressive front man in Kian Hutchison, this band is everything a New Brunswickan metal head enjoys; thrashing, growling and a killer stage presence to boot. It’ll be a worthwhile wait to see these guys hit the stage again. 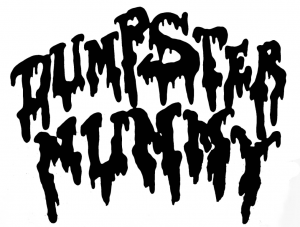 The kings of Garbage metal, Trash Metal if you will, Dumpster Mummy are the twisted puppet masters of one of the East Coast’s most original sounds. A Frankenstein of the weirdest sounds you can possibly imagine, bred within the confines of their self-proclaimed Funhouse in Dartmouth, NS, the Mummy has slowly been creeping up the ranks of the East Coast scene and have only recently started to receive the credit that they truly deserve. Recent recipients of the 2016 Loud Recording of the Year Award at this year’s East Coast Music Awards, this band has no intentions on resting on the success of their previous work. Upcoming dates such as the 13th installment of their annual Funhouse show and East Coast Awakening are in hindsight just warm up gigs to prepare themselves before they embark on their first ever cross Canada tour. With dates in every province across the country and a highly anticipated album as well as a new vocalist, both of which remain nameless, Dumpster Mummy is the band to watch not only at ECA but in the weeks that follow. So whether this weekend is first or fiftieth opportunity to see these guys, don’t waste it! Know a band playing at ECA that you think should be included on this list? Talk about them and let others know in the comments below! No love for Tactus? They’re about to release an album! How about Dark Shrine. These guys are ready to explode on the metal scene! Midnight Blue is a siiiick tune! Sleepshaker and Hitman are must see.